Handcuffs have unusual and contradictory design requirements: They must serve one human, and at the same time thwart another. For those who wield handcuffs, they must be light and efficient to put on and remove from a perpetrator. For the unfortunate wearer, the devices must restrain resistant wrists whether they happen to be thick or thin. And cuffs can't succumb to cleverness or brute force escape attempts. Modern handcuffs are great for accomplishing all of the above. But it took more than 100 years to perfect the design. Before the mid-19th century, a number of somewhat brutal methods failed on various points. In England, one painful device involved a metal apparatus in the shape of a figure eight. Only the most violent criminals were subjected to the shackles because they allowed minimal movement and injured the wrists of the wearer—something officers at the time saw as a bonus. A padlock design became obsolete when Harry Houdini showed that if you banged against something hard enough, the internal pin would release. 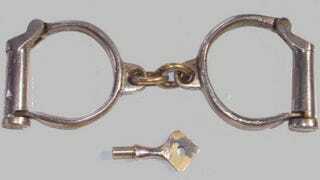 In the United States, the handcuff precursor was a single metal loop welded to a larger oval. The first loop was for both prisoner's hands and the second was for the officer to keep hold of: not comfy for anyone. But the most tortuous restraining device of the time was certainly the twister, which was a chain-link loop with a metal T attached. The chain slipped over both hands and the T was twisted until the law-breaking arms were painfully bound. These prisoner-keepers pretty much sucked for both prisoner and cop. As one ex-Scotland Yard criminal investigator wrote in 1894: "The English handcuffs are heavy, unwieldy, awkward machines, which at the best of times, and under the most favorable circumstances, are extremely difficult of application." Then George Carney invented the swing cuff in 1912 in Boston. The mechanism was brilliantly simple, and it was the beginning of the type of cuff you probably imagine when you think of handcuffs—they look similar to toy versions you may have had as a kid (or an adult, we do not judge!). They had a bow with teeth that swung 360 degrees through a double steel bottom piece. It continued to pivot through until it hit the wrist. At that point the top and bottom piece could be locked into place. The big advantage was officers could clamp perps' hands without a key. Other adjustable models were already on the market, but the swing cuff's ease of use made it a game-changer. In 1914, the Peerless Handcuff Company launched to advertise and sell swing cuffs. The effort put every other model of cuff out of business. "The thing about the design is that it was a relatively simple product to make; it was easier to use, lighter than previous ones and more cost effective to issue," explains Peerless' vice president Peter Gill, whose great grandfather started the company. With the swing, the handcuff finally became a modern tool that really worked for law enforcement. Carney's idea remains the biggest innovation in handcuff tech ever—and one we still use today. But swing cuffs could be brutal. When the top bow is pushed in, the cuffs click tighter. So, say, you leaned against a wall or fell on the ground, your wrists got squeezed and the only relief was getting your captor to unlock you with a key (or saying your safety word, depending on the situation). The solution, introduced not too long after the swing cuff itself, was a double lock that not only kept the shackles from popping open, but also kept them from closing too far. This was first accomplished with a key, but manual locking proved difficult while wrestling an unwilling prisoner. So Peerless came out with a mechanism activated by a quick jab on each bracelet. Although they've gotten lighter and thinner over time, the standard cuffs still mostly look like this. Today there's just more variation baked in: special special cuffs for people with larger and smaller wrists, and colored versions denoting inmates of different cellblocks or with health conditions. There are also high security varieties that don't accept the standard key. Hinge cuffs are a riff on the original, but their rigid folding design suspends motion more aggressively. There are also disposables, and you've probably seen them on the news. They were first introduced in the 1960s and look like cable ties. They're great for riots or other situations where officers need to secure lots of people quickly. Short-term handcuffs are one step up from disposables. They're mostly made with Nylon 6 and serve a similar purpose, but can be reused and unlocked with a standard handcuff key. As for the future, says Gill, "Who knows who's going to come up with a better mousetrap." We'll find out soon. By the end of this year, the National Institute of Justice is updating requirements for cuffs with increased strength and performance targets, which hasn't happened since the 1970s. The new standards will also include ankle and disposable restraints for the first time. Hopefully we'll soon see even more efficient cuffs that cause as little pain as possible. Unless of course that's what you're into.